Google Business Photos is a new product from Google that provides Google Virtual Tours for your business or organization. This virtual tour is featured on Google Search Results, Google Maps Results and your Google+ page. It improves your Search Engine Ranking and Increases Clickthroughs to your website. Based on Google Street View Technology these Virtual Tours allow online viewers to take a 360 degree walking tour of your business or organization. Simply by clicking the arrows in the tour you "walk" through the location. Viewers can look left, right, up down in any direction to experience your entire facility. These virtual tours are sometimes referred to as "Google Inside Street Views". The Search Engine Benefits these virtual tours offer are unmatched by other marketing tools. 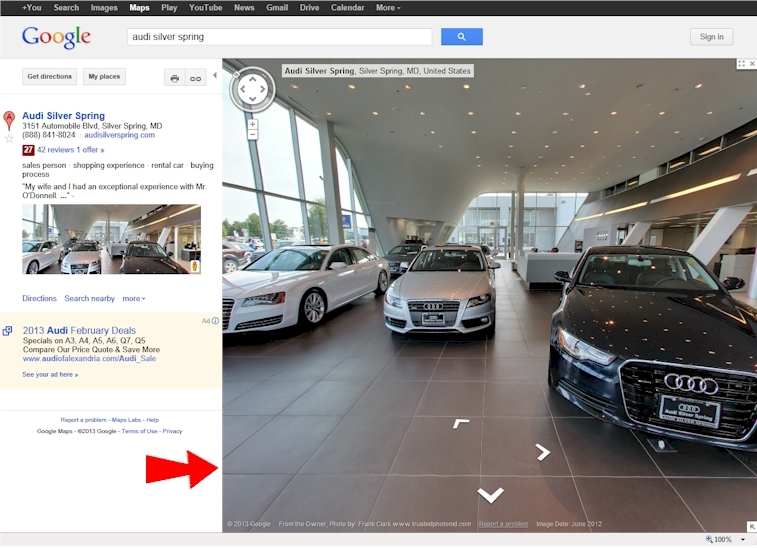 These virtual tours appear in Google Search Results, on Google Map Results and on Google+ Pages. No other virtual tours can do this. 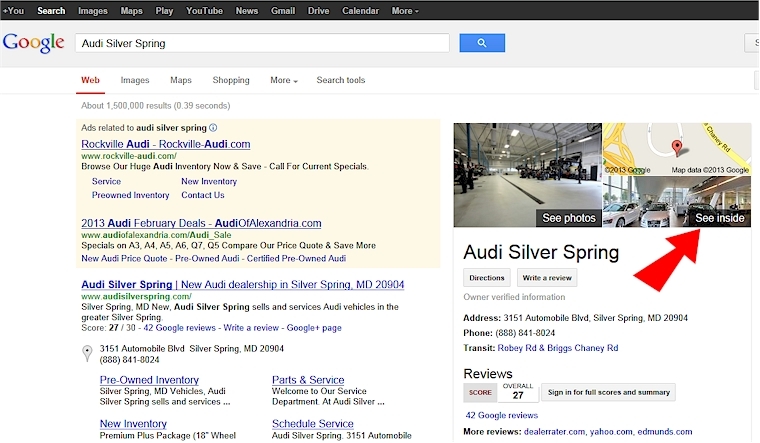 Google only allows their tours in search, maps, and Google+ results. Adding visual stimuli to Google Search results and Google Maps is POWERFUL. It increases the number clicks and brings more visitors to your website. And of course more web visitors means more business. FACT: The longer the customer spends with your website the higher the probability of selling to them. With a Google virtual tour you can extend the customer website experience and increase your chances of making a sale. Everyone knows that marketing with visual stimuli helps the sales process. That's why we show product photographs on our websites and social media. Just imagine the benefits of showing off your exceptional facility and products with a 360 degree fully interactive and immersive web experience? FACT: 80% of Internet shoppers say images are imperative when deciding to buy or use a company's product or services. (2006 Pew Internet & American Life Study). With a virtual tour you've opened your doors to the customer and created an atmosphere of openness and confidence in your business. The guesswork is gone and they can feel comfortable choosing your business. Not yet. However, the average customer is increasingly turning to the internet to visually pre-shop products, a business or service experience to save time. Also it is Google’s mandate is to shoot every facility and business in the world with these incredible tours. Businesses with these virtual tours will regularly perform better than their competitors. Finally, if every car dealership, restaurant, hotel and business has a Google Virtual Tour and your business does not, what does this say about your business? When you remove all obstacles and doubt about the quality of your business, your products and services you actually speed up the sales process. With Google Virtual Tours you have brought the customer into your facility, shown them your exceptional products and created goodwill. When they walk through yours doors they are ready to purchase. The Google Virtual Tour compared to other forms of marketing is very cost effective. The cost of a virtual tour is less than many businesses spend on Pay Per Click or other online programs in just a few days or weeks. Many business owners like that it's is a one-time fee paid to the Google Photographer and that's it. Then the virtual tour and all of the still photographs taken during the photo shoot become their property with full copyright usage. Who Takes These These Virtual Tours? Google Trusted Photographers certified by Google, Inc. come to your place of business and take both the Google Virtual Tour and also 15 professional still photographs. Once complete the Virtual Tour is uploaded to your Google+ Page along with the 15 still photographs. All of which are become the property of the business and can be used for any use such as websites, social media posts, galleries, email blasts, postcards, etc.). Google Trusted Photographers are available in any location in the United States and Canada. Advertising your businesses through Google Virtual Tours will give your establishments a competitive edge.